Welcome to Sacred Heart Elementary School, home of the Lancers! The Dominican Sisters along with lay partners strive to provide an excellent education which will prepare our students for their future. Our mission and philosophy is to educate and develop the individual’s unique potential while fostering the person’s human dignity. We also believe that parents are the primary educators of their children. All of us must continually foster a faith community which witnesses to Gospel values and shares in the Kingdom of God. Furthermore, our educational program, permeated by Catholic teaching and values, develops the individual’s self-esteem through the development of the whole person-spiritually, intellectually, physically, socially, culturally, psychologically, and aesthetically-to enable him/her to become a mature adult who is a positive, contributing member in the church and society. Sacred Heart Elementary School provides a welcoming, warm, safe and secure environment for all with a very close community spirit. Please come visit our campus and see the wonderful accomplishments and enthusiasm for learning that takes place everyday. 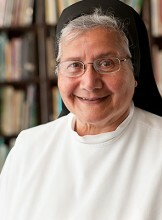 Sister Maria Elena Gutierrez, O.P.